TMGlobal Solutions, a division of the Target Marketing Group , has over 25 years of “Direct” source experience. 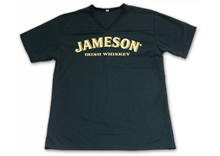 We have the experience to Design, Source and Deliver your custom merchandise. With over 25 years of experience and our expansive network, TMGlobal Solutions has the resources and the depth of understanding to deliver. We can save you money by "Direct" sourcing any promotional product on the market or we can create an entirely custom product for you. Your order will undergo a continuous process of Quality Control from the moment you place an order with TMGlobal Solutions until final delivery. Our system is proven and highly effective, with checks and balances from sampling to mass production to the delivery of your order to your door. We use internationally recognized third party agencies at each factory site to guarantee your product passes your specified requirements and your quality expectations. You can rest easy. Our order management process is one seamless operation all dedicated to delivering quality product on time. All of our products will comply with current U.S. Consumer Products Safety Legislation and Proposition 65 Requirements. We are committed to conducting business in a socially responsible & ethical manner accordingly to local & national legal requirements. We will not use any form of forced labor. We will not use child labor. We respect the right of collective bargaining by our employees & provide a safe work workplace. We will not discriminate on basis of age, nationality, race, religion, social or ethnic orientation, gender or disability. We require all business that support our business as manufacturers or sources of goods to comply will all of the same policies stated above. Delivering your order from an offshore factory is a complex process. TMGlobal solutions will manage this process for you. From the factory floor to your door, we handle the complete move, including Customs and Duties clearance. Thanks to long-term relationships with brokers and shipping companies worldwide, we can offer priority handling, improved delivery times, and reduced shipping costs. We’ve created custom, “one-of-a-kind” products for many of our clients. We'll take your rough concept and create an artist rendition for you so you can see your idea come to life before it begins the sample and manufacturing process. From digitizing to logo creation and full 3D product renderings. We design keeping in mind the manufacturing process, making sure your initial design integrity through production. 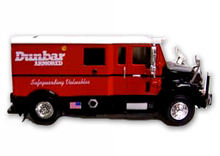 We developed this 1:64 scale replica truck for Dunbar’s client gifts & trade shows. The scale is exact and the replica was developed after many approval steps. The packaging was custom designed. We were able to save the client $3.00 each on these versus the price they received from Mattel. For a quantity of 5,000 for a $15,000 savings for the same quality product. 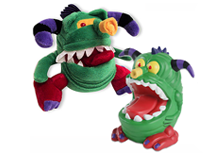 TMG “re-sourced” two of the most popular items in their corporate identity program; the Monster plush and Monster stress toy. By using a factory in China and an agent in Hong Kong, we were able to deliver both products for less than half the price without quality being compromised. 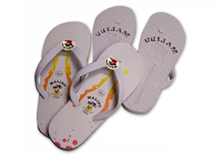 TMG designed and manufactured these custom Malibu Rum flip-flops using the client’s artwork and also creating a three-dimensional logo for the center strap. These were manufactured in eight different sizes and individually size labeled and packaged. The client desired a promotional product that was inexpensive, medically relevant and whimsical to promote a pediatric drug called Synagis. 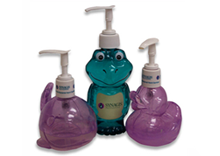 TMG developed the hand sanitizer that was dyed to match their PMS colors and packaged in the custom molded characters. Order repeated for three years. 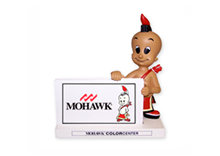 Mohawk Carpets wanted an inexpensive desk item for their dealers to announce the reintroduction of their timeless character — Tommy Mohawk. TMG developed the Tommy business card holder for $7.50 each. 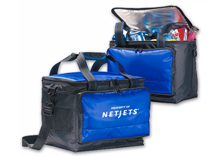 Client specified an insulated cooler from a US supplier of promotional bags. TMG sourced the product direct in China and has saved the client over $4.00/unit on each order of 1500 bags which repeats twice per year. TMG also set up a website for a client to call inventory out of our warehouse. 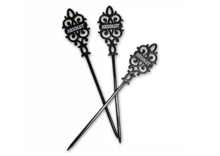 TMG designed and manufactured this custom swizzle stick/skewer for Pernod Ricard to be used as a value-added distributor incentive. This is the second time TMGlobal Solutions has been able to provide this item with a custom designed mold and quick overseas production. TMG designed and manufactured this custom apparel item. This is an original concept piece created from conceptual drawings. The jersey style fabric is custom dyed to match brand colors and the screening ink is an exact brand match. 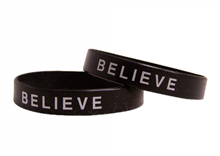 As part of an awareness campaign, the Mayor’s office requested an order of the ever popular awareness bracelets. TMG was able to deliver 5,000 bracelets in 7 days for $0.35 each! GGP wanted to develop a high-quality premium gift for a frequent purchase program for their mall shoppers. 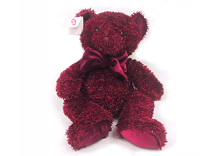 TMG developed the velveteen Teddy Bear. The Client bought 40,000 bears for $7.00 each, SAKS 5th Avenue was selling the bear for $39.00! Vulcan was looking for a clever inexpensive tradeshow item for less than $1.00 each. 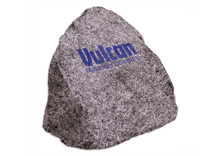 TMG developed and produced the Vulcan Rock stress toy. A tremendous hit!